Cognitive Behavioural Therapy (CBT) is a method that can help manage problems by changing the way patients would think and behave. It is not designed to remove any problems but help manage them in a positive manner  . Behaviour therapy (BT) was developed in the 1950’s independently in three countries: South Africa, USA and England . It was further developed to Cognitive Therapy (CT) in the 1970’s by Dr Aaron Beck with its main application on people with depression, anxiety and eating disorders  . However, the main evidence today focuses on CBT, after the merging of BT and CT in the late 80’s . 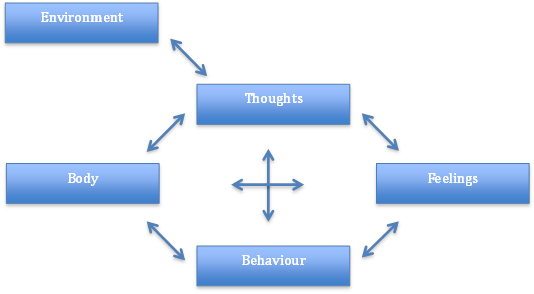 Aaron Beck and Christine Padesky first recognised this CBT model in the 1970s . Negative thoughts (e.g., "My back pain is uncontrollable" --> Negative feelings (e.g., depression, anger) and maladaptive health behaviours (e.g., skipping treatment sessions) --> Reinforcing negative cycle. If one negative thought can be changed or better understood, then it can break down this negative cycle. This can be addressed through education and methods to manage symptoms .